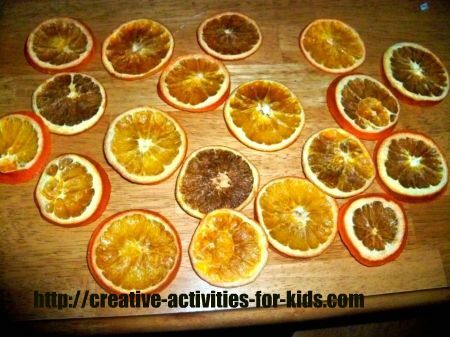 Making dried fruit is easy, and can be used in many craft projects. You can make fragrant decorations for your home, or to give as gifts. Dried fruit can be made into garlands, potpourri, or sachets. You can eat it too! Yum! I am listing two different ways it can be made. If you have a food dehydrator or an oven then you can make this. 2.Slice your fruit 1/4 inch thick crosswise, if you have a mandolin slicer this would be a great use for it. Parents will do this step due to safety issues. 3.Brush the sliced fruit with lemon juice on both sides. 5.Arrange your slices in a single layer on greased cookie sheets, or baking stones. 6.Bake for one hour, remove from oven, and flip fruit over. Parents will do this step due to safety issues. 7.Continue to bake for 1 ½ more hours. If they do not seem totally dried out cook for longer after flipping again. You should wash and slice fruit as mentioned in above recipe for oven drying. Follow the directions that were given with your dehydrator. Different fruits will require different drying times. Fruit will often darken while dehydrating it. If you are concerned with that toss your fruit in lemon juice before drying. Once it is finished store in air tight containers. You can use your dried fruit for eating, or for crafting. Best picks for crafting: citrus fruits, apples, and pears. You can often find fruit dehydrators new in the box at your local thrift store. Check out my fruit leather recipe, in the kid’s recipes section! Did you like making dried fruit? Try more recipes here!